Even though it is Saturday, I was up by 5:30. We are heading out this morning for a short trip across the Sierras, and I like to get an early start. Malida doesn't, and is still sleeping. She'll get up soon and we will be off. Our first objective is to stop at Cooks Station, up highway 88, for breakfast. We usually stop there on our way home from being up in the Sierras for a hamburger, as they have the best burgers for miles around. The last time we were there Malida got some sort of burger with bacon on it, and that bacon was the best bacon I have ever tasted. I vowed that someday, I would have breakfast there. That day has come. I was still kind of perturbed about our crappy paper signage being taken down at work, and decided to take action, both upright and subversive. 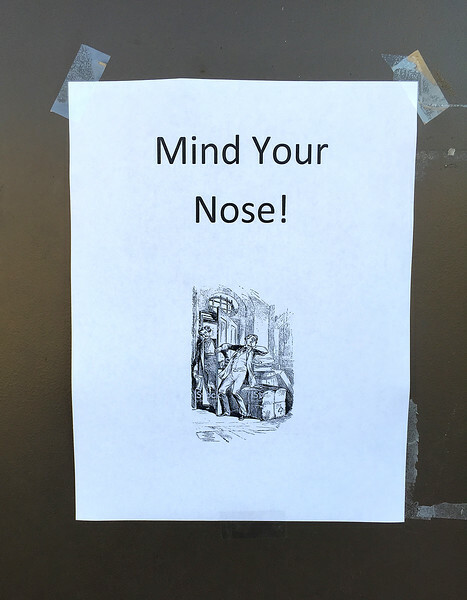 I walked around the campus to see who else had their signs removed from their doors, as they are a hazard to the nose. And guess what? No one else. Particularly no one else in our division. So I wrote an email to the dean, talking about how the lack of signage is an inconvenience to our students (and the faculty), and asked why it is that we have been there 15 months, and still don't have proper signage? I received a reply about an hour later that the dean and the operations manager would be by on Tuesday to determine the proper signage and get it done. Not being completely contented, I decided to create my own signage. Signage that would hopefully mitigate the risk to impressionable young noses. It is my masterpiece. Thanks to Meowmensteen (who also helped me name my garden gnome Monty)for the suggestion. There is an undercurrent to this signage thing, as well as all the other stuff it has been difficult for us to get. I don't think I'll go into it at the moment, but I believe that it is related to nursing (and the nursing program) being a predominantly female profession, and not really given a seat at the table. I got some figurines in the mail the other day. 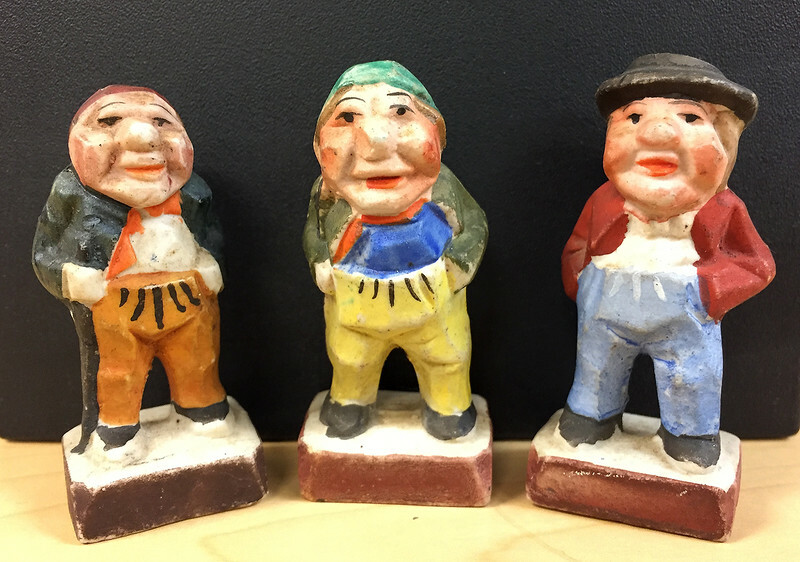 I saw them when I was shopping for my garden gnome, and the price was right. They are little German workers, each about the size of a thumb. They were made in occupied Japan after WWII. Apparently this was part of MacArthur's plan to rebuild the Japanese economy after the war. It worked. I'm not sure where these guys will end up. My desk is already kind of crowded with little things. They'll find their spot eventually. Time to go wake Malida up so I can have delicious bacon.